Tart cherries. Preserved in vodka. Flavored with black pepper, lemon. A friend posted a picture to facebook, a jar of deep red brandied cherries. so of course I ran right out to the local farmers market to grab a bushel of the sour little gems. I didn’t have any brandy, and I’m not a huge brandy drinker anyway, so I started kicking around some ideas to spice up vodka and make a cordial worthy of these little seasonal treats. I love black pepper infused simple syrup for an unexpected flavor in summer cocktails. Lemon juice and rind to bring added depth. 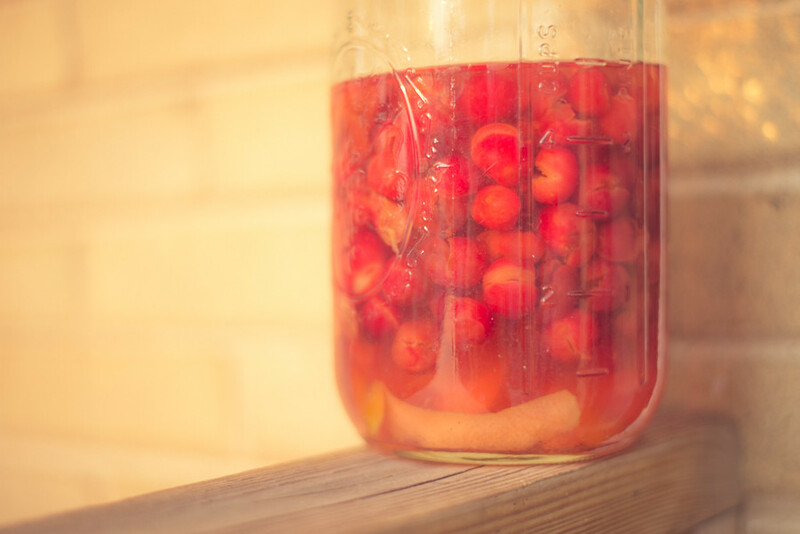 Vodka to preserve, will also turn into a lovely cordial that will taste great on the rocks or with soda water after the cherries and lemon infuse the vodka. Bring sugar, water, peppercorns, and lemon rind to a boil, boil for several minutes until sugar is completely dissolved. Let simple syrup seep 1 hour to overnight to infuse syrup with flavor, strain the mixture and add syrup, cherries, and lemon rind, lemon juice, and vodka to large glass jar. Let sit, agitating periodically, for 6 weeks. Lucky lady, hobbyist homesteader, babywearer. Wife to witty and handsome husband, mom to two awesome kids, one who happens to have an extra chromosome. Copyright © 2019 The Maiden Metallurgist. All rights reserved.